In the end only three of the higher seeds were eliminated from the EuroCup Women during the eighth-final round. However the second leg of action once again was highlighted with strong performances from a players under the age of 22. Elitzur Ramla's defense of the EuroCup has come to an abrupt end. They failed to overturn the 10-point deficit from game one against Kayseri Kaski despite winning the second game (70-64). Elitzur Ramla were leading the game (70-59) with a minute left to play. They would have qualified if the game had ended then. But they turned the ball over a couple of times and missed two free throws during the last minute while their opponents, Kayseri Kaski scored enough points for the aggregate win (143-139). Tahisha Wright and Shay Doron scored 25 and 24 points each for the Israeli champions while Latoya Sanders had 17 points for the team from Turkey. The next top seed to fall was Besiktas JK who lost at home to Gran Canaria 2014. Besiktas restored Courtney Vandersloot into the line-up for this game. She replaced Candice Wiggins who was ejected during her EuroCup Women début in game one. 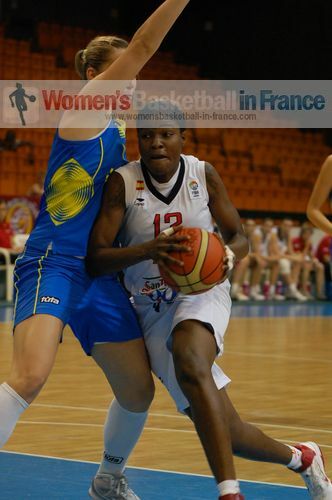 Besiktas, trailing by 9 points in game one, were never in this game as they allowed Astou Ndour and Vanessa Blé (in picture) to win rebound after rebound at both ends of the court as the Spanish team ran out winners of the game (78-61) and the series (147-121). Dandaa Moss once again led the scoring with 21 points, while Ndour added 19 and Blé 11 points to her 14 rebounds. The number 9 seeds MBK Ruzomberok completed the double over number 8 seeds Optimum TED (76-67) for an aggregate score victory (147-132). Dynamo Kursk had their foot in the quarter final with a 27-point first leg lead. They were able to rest key players and still beat BC Horizont (78-53) for an aggregate score victory (160–108). USO Mondeville failed to hold on to their 11-point lead against Botas Sports Club and became the only team to win the first leg and then to be eliminated. With just under two minutes to play Mondeville trailed by just 4 points but still had an aggregate score lead of 7 points. Quianna Chaney and Noel Kuin caught fire and blew Mondeville away with must of the points in a 12-1 finish to win the game (82-67) and the series (140-136). BC Chevakata completed the double against the Lotto Young Cats (81-53) for a series victory (163-108). Olesia Malashenko led the scoring for the Russians with 13 points while Emma Meesseman top scored again for the Lotto Young Cats. Arras and Hainaut Basket booked their quarter-final places with victories at home. The quarter-final series of matches are scheduled for 2 - 9 February 2012. However the dates may change.